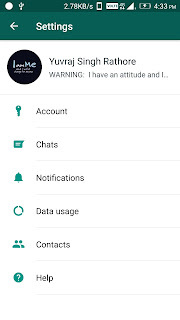 HOW TO SECURE WHATSAPP. AAPNE PICHLI POST MAIN PADHA THA KI KESE WHATSAPP ACCOUNT HACK KRE AUR KESE PATA KARE WHATSAPP HACK HAI YA NAHIES POST MAIN AAP JANEGE KI KIS TARH AAP APNE WHATSAPP ACCOUNT KO BACHA SAKTE HAI HACK HONE SE.POST KI SURUWAT SE PHLE AGAR AAPNE PHLE KE POST NHI PADHE HAI HAI TO WO JARUR PADH LENA CHAHIYETAKI AAPKO PATA CHAL SAKE KI KOI BHI AAPKA WHATSAPP ACCOUNT KESE KESE HACK KAR SAKTA HAI. APNA MOBILE HAR KISI KE HAATO MAIN NA DE. 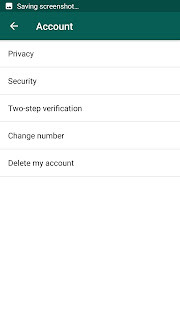 AB AAPKE SAMNE JO OPESTION KHULE HAI USME TWO-STEP VERIFICATION KO CHOOSE KRE. 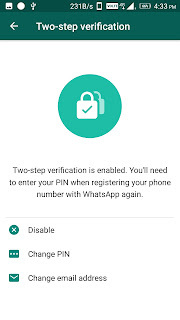 STEP 7:- ESME APNA KOI BHI PIN DAAL DE JO YAAD RAHE AAPKOSTEP 8:- PIN VERIFY HONE KE BAAD AAP USE BADAL BHI SAKTE HAI AUR FORGOT KE LIYE EMAIL BHI ADD KAR SAKTE HAI. 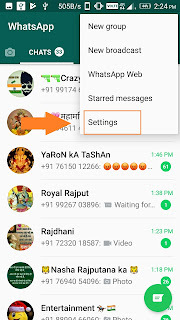 JAB BHI WHATSAPP KO LAGEGA KI AAPKA WHATSAPP HACK KRNE KI KOSIS KI JA RHI HAI YA HACK HUA HAI TO WO AAPSE WO PIC PUCH LEGA JISKO YE PIN PATA NHI HOGA USKE PASS AAPKA WHATSAPP ON NHI HO PAYEGA.VIDEO JARUR DEKHE. IS TARH SE AAP APNE WHATSAPP ACCOUNT KO SECURE RAKH SAKTE HAI. JIS SE AAPKE ACCOUNT KO KOI HACK NHI KAR PAYEGA. AUR BHI POST PADHNE KE LIYE JUDE RAHE HMARE SAATH.